The Wounded Knee Incident in 1973 was one of the final sparks was the conviction of Harold Schmidt of involuntary manslaughter. On January 21, 1973 Harold Schmidt murdered Wesley "Bad Heart" Bull, a major leader in the AIM (American Indian Movement) organization. This organization was founded on the belief of retaining Indian rights and the retention of Oglala lifestyle; this act of injustice was the final straw. Many AIM supporters called his sentence a "slap on the wrists"; just as a year earlier, the abduction, beating and eventual death of Raymond Yellow Thunder by two white men who after arrest were released without bail. Feeling justice was not served and deep divides on appropriate response among various factions of tribal members resulted in the February 27, 1973 siege by 2oo plus AIM leaders and supporters of Wounded Knee, South Dakota in protest of the unjust decisions and treatment the Bureau of Indian Affairs. 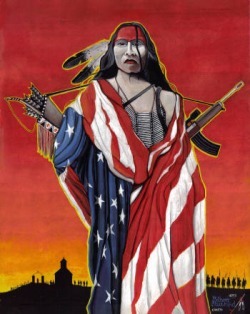 The Oglala Sioux (Lakota Nation) was the actual tribe that held Wounded Knee for 71 days. The government sent out 50 U.S. Marshals to immediately respond to the threat. The FBI soon after got involved in this domestic dispute. Record shows that over half a million dollars were used in men, roadblocks, and other supplies necessary for the government occupation of this small town. Harlington Wood Jr., asst. Attorney General for the civil division of the U.S. Justice Department. Wood was credited with ending the longstanding feud between America and AIM. On May 5 AIM officially disarmed and left the town of Wounded Knee, South Dakota. This protest was different and ironic because it was justified by a lack of justice. The American judicial system failed American Indians by unjustly serving a murderer and other perpetraitors of violence against Indians. This towns' selection was also very ironic because The Wounded Knee Massacre (December 29, 1890) had been considered the last resistance of the Sioux tribes. 300 unarmed women and children were murdered in cold blood by the hands of the United States military (7th Calvary). This protest set the precedent for protest to come for the next 40 years. In the next few years there would be an influx of violent demonstrations against the federal government. The Branch Dividend (Waco, TX) controversy and Oklahoma City bombing were deep blows to the country and in many ways a parallel to the Wounded Knee Incident. The News headlines in 1973 read "government trying to control a bunch of terrorists"; in 1993 the words "in Waco, Texas" were the only thing added to the 1973 caption. In neither case was the headline accurate merely an attempt to cover government actions against peoples trying to maintain their chosen paths of life. Wounded Knee. Native American Ecards, Native-Americans.org. Native-Americans. org. 10 May 2009 <http://dipity.s3.amazonaws.com/uploads/events/be0b3b73ce4180d46d3d1c62532660d1.jpg>. Stories from Wounded Knee 1973. Perf. Bill Means. Youtube. 27 July 2007. 8 May 2009 <http://www.youtube.com/watch?v=FJRn8s5jmOM>.